This 41" x 31" Flat - 19.75" Diameter Plastic Bottom Bag fits the G0525, G0548/Z/ZP, G0562/Z/ZP, G1029/Z2/Z2P, G1030Z/Z2/Z2P, and G1028Z/Z2 Dust Collectors. These bags work perfectly on my harbor freight dust collector. You can't run your dust control without these. When we bought the dust collector like 11 years ago 2 of these came with it. They have lasted well since we fill them and empty them so much. Not sure how long these will hold up to everyday use. This product works well and is a really good value. Not much to say about spare vacuum bags. But the came in a timely fashion and are of good quality. The drill press that I recently purchased is everything that I expect from Grizzly products. I have been using Grizzly products for several years and my only regret is that I waited so long before buying the best. It makes life a little easier for me every time I upgrade to Grizzly products. These are my go to bags. Throw away and priced as such. I like being able to see when Im getting full instead of having to check all the time. Plus, we use so many different woods in the shop its fun to watch the art happen in the bag. These bags are nice and thick and seem to hold up very well. These bags are hit or miss. I've had some bags that survive 7-8 uses and then ones that fail after one use. It all depends on the process and wood chip size. The jointer and planer seem to be the hardest on these bags. 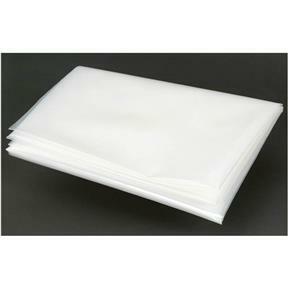 It would be great to have an option for a thicker 30 mil poly bag that could provide hundreds of uses. I bought about a month ago and couldnt be happier. Excellent dust collector. I repacked the 4 bag clips with small clamps. That would be my only recommendation. Ordering from your company is simple and convenient. We are having issues with the bottoms coming out of the bags. Perfect fit on the Dust Collector, very handy to see when to empty the bag. No mess. I bought this collector used, and needed new bag. Fit perfect and came in two days. Exactly what was needed for my dust collector came quickly. I like watching the wood chips cyclone around inside the bag. The see through characteristic makes knowing when it is time to empty easy. Nice product but not indestructible if you want to reuse them, They blow out after a while. I am going to try emptying them when 3/4 full to see if they last longer.Happy Woodworking to all! I bought this to replace an existing bag that had begun to crack. At the same time I purchased a felt bag. The felt bag get me much more effective air flow through the system compared to the plastic bag, but cost more. Its a trade off, but my dust collection system is on the second floor so I needed a little extra draw. Both are effective. Nice heavy bag. I'm always waiting to long to empty it. Bag holds up well. This is a standard plastic bottom bag for dust collectors. Fine. I bought these because I wanted the correct fit so I went to the oem to purchase for that purpose. Very good but it took me awhile to find it at your Web site. Why aren't the bags listed with the dust collecter you sold me? I didn't find them the first time I tried. I bought these bags a month ago to support my woodworking shop. They work perfect with my dust & wood chips collector.